“That’s very nice of you.” She nodded at him above her cup and smiled, but there was a little formal tightness in her tone which had not been there when she greeted him in the hall. The door from the hall opened, a voice called “Winifred?” hurriedly, and a big man came through the drawing-room with a quick, heavy tread, bringing with him a smell of cigar smoke and chill out-of-doors air. When Alexander reached the library door, he switched on the lights and stood six feet and more in the archway, glowing with strength and cordiality and rugged, blond good looks. There were other bridge-builders in the world, certainly, but it was always Alexander’s picture that the Sunday Supplement men wanted, because he looked as a tamer of rivers ought to look. Under his tumbled sandy hair his head seemed as hard and powerful as a catapult, and his shoulders looked strong enough in themselves to support a span of any one of his ten great bridges that cut the air above as many rivers. After dinner Alexander took Wilson up to his study. It was a large room over the library, and looked out upon the black river and the row of white lights along the Cambridge Embankment. The room was not at all what one might expect of an engineer’s study. Wilson felt at once the harmony of beautiful things that have lived long together without obtrusions of ugliness or change. It was none of Alexander’s doing, of course; those warm consonances of color had been blending and mellowing before he was born. But the wonder was that he was not out of place there,—that it all seemed to glow like the inevitable background for his vigor and vehemence. He sat before the fire, his shoulders deep in the cushions of his chair, his powerful head upright, his hair rumpled above his broad forehead. He sat heavily, a cigar in his large, smooth hand, a flush of after-dinner color in his face, which wind and sun and exposure to all sorts of weather had left fair and clear-skinned. “Like her niece?” Wilson queried. 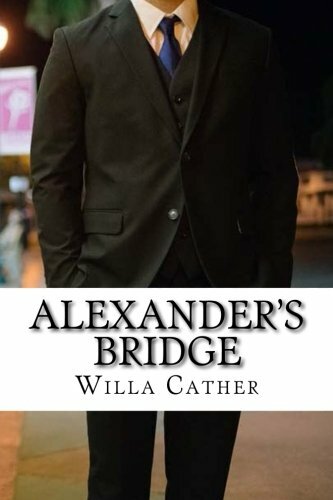 “Yes, I beg you, Mrs. Alexander,” Wilson began, but he got no further. “Why, certainly, if you won’t find me too noisy. I am working on the Schumann `Carnival,’ and, though I don’t practice a great many hours, I am very methodical,” Mrs. Alexander explained, as she crossed to an upright piano that stood at the back of the room, near the windows. On the night of his arrival in London, Alexander went immediately to the hotel on the Embankment at which he always stopped, and in the lobby he was accosted by an old acquaintance, Maurice Mainhall, who fell upon him with effusive cordiality and indicated a willingness to dine with him. Bartley never dined alone if he could help it, and Mainhall was a good gossip who always knew what had been going on in town; especially, he knew everything that was not printed in the newspapers. The nephew of one of the standard Victorian novelists, Mainhall bobbed about among the various literary cliques of London and its outlying suburbs, careful to lose touch with none of them. He had written a number of books himself; among them a “History of Dancing,” a “History of Costume,” a “Key to Shakespeare’s Sonnets,” a study of “The Poetry of Ernest Dowson,” etc. Although Mainhall’s enthusiasm was often tiresome, and although he was often unable to distinguish between facts and vivid figments of his imagination, his imperturbable good nature overcame even the people whom he bored most, so that they ended by becoming, in a reluctant manner, his friends. In appearance, Mainhall was astonishingly like the conventional stage-Englishman of American drama: tall and thin, with high, hitching shoulders and a small head glistening with closely brushed yellow hair. He spoke with an extreme Oxford accent, and when he was talking well, his face sometimes wore the rapt expression of a very emotional man listening to music. Mainhall liked Alexander because he was an engineer. He had preconceived ideas about everything, and his idea about Americans was that they should be engineers or mechanics. He hated them when they presumed to be anything else. Just then they drove up to the Duke of York’s, so Alexander did not commit himself, but followed Mainhall into the theatre. When they entered the stage-box on the left the first act was well under way, the scene being the interior of a cabin in the south of Ireland. As they sat down, a burst of applause drew Alexander’s attention to the stage. Miss Burgoyne and her donkey were thrusting their heads in at the half door. “After all,” he reflected, “there’s small probability of her recognizing me. She doubtless hasn’t thought of me for years.” He felt the enthusiasm of the house at once, and in a few moments he was caught up by the current of MacConnell’s irresistible comedy. The audience had come forewarned, evidently, and whenever the ragged slip of a donkey-girl ran upon the stage there was a deep murmur of approbation, every one smiled and glowed, and Mainhall hitched his heavy chair a little nearer the brass railing. The second act opened before Philly Doyle’s underground still, with Peggy and her battered donkey come in to smuggle a load of potheen across the bog, and to bring Philly word of what was doing in the world without, and of what was happening along the roadsides and ditches with the first gleam of fine weather. Alexander, annoyed by Mainhall’s sighs and exclamations, watched her with keen, half-skeptical interest. As Mainhall had said, she was the second act; the plot and feeling alike depended upon her lightness of foot, her lightness of touch, upon the shrewdness and deft fancifulness that played alternately, and sometimes together, in her mirthful brown eyes. When she began to dance, by way of showing the gossoons what she had seen in the fairy rings at night, the house broke into a prolonged uproar. After her dance she withdrew from the dialogue and retreated to the ditch wall back of Philly’s burrow, where she sat singing “The Rising of the Moon” and making a wreath of primroses for her donkey. The playwright gave Mainhall a curious look out of his deep-set faded eyes and made a wry face. “And have I done anything so fool as that, now?” he asked. When they reached their box the house was darkened and the orchestra was playing “The Cloak of Old Gaul.” In a moment Peggy was on the stage again, and Alexander applauded vigorously with the rest. He even leaned forward over the rail a little. For some reason he felt pleased and flattered by the enthusiasm of the audience. In the half-light he looked about at the stalls and boxes and smiled a little consciously, recalling with amusement Sir Harry’s judicial frown. He was beginning to feel a keen interest in the slender, barefoot donkey-girl who slipped in and out of the play, singing, like some one winding through a hilly field. He leaned forward and beamed felicitations as warmly as Mainhall himself when, at the end of the play, she came again and again before the curtain, panting a little and flushed, her eyes dancing and her eager, nervous little mouth tremulous with excitement. When Alexander returned to his hotel—he shook Mainhall at the door of the theatre—he had some supper brought up to his room, and it was late before he went to bed. He had not thought of Hilda Burgoyne for years; indeed, he had almost forgotten her. He had last written to her from Canada, after he first met Winifred, telling her that everything was changed with him—that he had met a woman whom he would marry if he could; if he could not, then all the more was everything changed for him. Hilda had never replied to his letter. He felt guilty and unhappy about her for a time, but after Winifred promised to marry him he really forgot Hilda altogether. When he wrote her that everything was changed for him, he was telling the truth. After he met Winifred Pemberton he seemed to himself like a different man. One night when he and Winifred were sitting together on the bridge, he told her that things had happened while he was studying abroad that he was sorry for,—one thing in particular,—and he asked her whether she thought she ought to know about them. She considered a moment and then said “No, I think not, though I am glad you ask me. You see, one can’t be jealous about things in general; but about particular, definite, personal things,”—here she had thrown her hands up to his shoulders with a quick, impulsive gesture—“oh, about those I should be very jealous. I should torture myself—I couldn’t help it.” After that it was easy to forget, actually to forget. He wondered to-night, as he poured his wine, how many times he had thought of Hilda in the last ten years. He had been in London more or less, but he had never happened to hear of her. “All the same,” he lifted his glass, “here’s to you, little Hilda. You’ve made things come your way, and I never thought you’d do it. It was a warm, smoky evening, and there was a grimy moon. He went through Covent Garden to Oxford Street, and as he turned into Museum Street he walked more slowly, smiling at his own nervousness as he approached the sullen gray mass at the end. He had not been inside the Museum, actually, since he and Hilda used to meet there; sometimes to set out for gay adventures at Twickenham or Richmond, sometimes to linger about the place for a while and to ponder by Lord Elgin’s marbles upon the lastingness of some things, or, in the mummy room, upon the awful brevity of others. Since then Bartley had always thought of the British Museum as the ultimate repository of mortality, where all the dead things in the world were assembled to make one’s hour of youth the more precious. One trembled lest before he got out it might somehow escape him, lest he might drop the glass from over-eagerness and see it shivered on the stone floor at his feet. How one hid his youth under his coat and hugged it! And how good it was to turn one’s back upon all that vaulted cold, to take Hilda’s arm and hurry out of the great door and down the steps into the sunlight among the pigeons—to know that the warm and vital thing within him was still there and had not been snatched away to flush Caesar’s lean cheek or to feed the veins of some bearded Assyrian king. They in their day had carried the flaming liquor, but to-day was his! So the song used to run in his head those summer mornings a dozen years ago. Alexander walked by the place very quietly, as if he were afraid of waking some one. He crossed Bedford Square and found the number he was looking for. The house, a comfortable, well-kept place enough, was dark except for the four front windows on the second floor, where a low, even light was burning behind the white muslin sash curtains. Outside there were window boxes, painted white and full of flowers. Bartley was making a third round of the Square when he heard the far-flung hoof-beats of a hansom-cab horse, driven rapidly. He looked at his watch, and was astonished to find that it was a few minutes after twelve. He turned and walked back along the iron railing as the cab came up to Hilda’s number and stopped. The hansom must have been one that she employed regularly, for she did not stop to pay the driver. She stepped out quickly and lightly. He heard her cheerful “Good-night, cabby,” as she ran up the steps and opened the door with a latchkey. In a few moments the lights flared up brightly behind the white curtains, and as he walked away he heard a window raised. But he had gone too far to look up without turning round. He went back to his hotel, feeling that he had had a good evening, and he slept well. He crossed back to Westminster, went up to the Temple, and sat down to smoke in the Middle Temple gardens, listening to the thin voice of the fountain and smelling the spice of the sycamores that came out heavily in the damp evening air. He thought, as he sat there, about a great many things: about his own youth and Hilda’s; above all, he thought of how glorious it had been, and how quickly it had passed; and, when it had passed, how little worth while anything was. None of the things he had gained in the least compensated. In the last six years his reputation had become, as the saying is, popular. Four years ago he had been called to Japan to deliver, at the Emperor’s request, a course of lectures at the Imperial University, and had instituted reforms throughout the islands, not only in the practice of bridge-building but in drainage and road-making. On his return he had undertaken the bridge at Moorlock, in Canada, the most important piece of bridge-building going on in the world,—a test, indeed, of how far the latest practice in bridge structure could be carried. It was a spectacular undertaking by reason of its very size, and Bartley realized that, whatever else he might do, he would probably always be known as the engineer who designed the great Moorlock Bridge, the longest cantilever in existence. Yet it was to him the least satisfactory thing he had ever done. He was cramped in every way by a niggardly commission, and was using lighter structural material than he thought proper. He had vexations enough, too, with his work at home. He had several bridges under way in the United States, and they were always being held up by strikes and delays resulting from a general industrial unrest. Though Alexander often told himself he had never put more into his work than he had done in the last few years, he had to admit that he had never got so little out of it. He was paying for success, too, in the demands made on his time by boards of civic enterprise and committees of public welfare. The obligations imposed by his wife’s fortune and position were sometimes distracting to a man who followed his profession, and he was expected to be interested in a great many worthy endeavors on her account as well as on his own. His existence was becoming a network of great and little details. He had expected that success would bring him freedom and power; but it had brought only power that was in itself another kind of restraint. He had always meant to keep his personal liberty at all costs, as old MacKeller, his first chief, had done, and not, like so many American engineers, to become a part of a professional movement, a cautious board member, a Nestor de pontibus. He happened to be engaged in work of public utility, but he was not willing to become what is called a public man. He found himself living exactly the kind of life he had determined to escape. What, he asked himself, did he want with these genial honors and substantial comforts? Hardships and difficulties he had carried lightly; overwork had not exhausted him; but this dead calm of middle life which confronted him,—of that he was afraid. He was not ready for it. It was like being buried alive. In his youth he would not have believed such a thing possible. The one thing he had really wanted all his life was to be free; and there was still something unconquered in him, something besides the strong work-horse that his profession had made of him. He felt rich to-night in the possession of that unstultified survival; in the light of his experience, it was more precious than honors or achievement. In all those busy, successful years there had been nothing so good as this hour of wild light-heartedness. This feeling was the only happiness that was real to him, and such hours were the only ones in which he could feel his own continuous identity—feel the boy he had been in the rough days of the old West, feel the youth who had worked his way across the ocean on a cattle-ship and gone to study in Paris without a dollar in his pocket. The man who sat in his offices in Boston was only a powerful machine. Under the activities of that machine the person who, in such moments as this, he felt to be himself, was fading and dying. He remembered how, when he was a little boy and his father called him in the morning, he used to leap from his bed into the full consciousness of himself. That consciousness was Life itself. Whatever took its place, action, reflection, the power of concentrated thought, were only functions of a mechanism useful to society; things that could be bought in the market. There was only one thing that had an absolute value for each individual, and it was just that original impulse, that internal heat, that feeling of one’s self in one’s own breast. One Sunday evening, at Lady Walford’s, Alexander did at last meet Hilda Burgoyne. Mainhall had told him that she would probably be there. He looked about for her rather nervously, and finally found her at the farther end of the large drawing-room, the centre of a circle of men, young and old. She was apparently telling them a story. They were all laughing and bending toward her. When she saw Alexander, she rose quickly and put out her hand. The other men drew back a little to let him approach. “Miss Burgoyne was just telling us about a donkey-boy she had in Galway last summer,” Sir Harry Towne explained as the circle closed up again. Lord Westmere stroked his long white mustache with his bloodless hand and looked at Alexander blankly. Hilda was a good story-teller. She was sitting on the edge of her chair, as if she had alighted there for a moment only. Her primrose satin gown seemed like a soft sheath for her slender, supple figure, and its delicate color suited her white Irish skin and brown hair. Whatever she wore, people felt the charm of her active, girlish body with its slender hips and quick, eager shoulders. Alexander heard little of the story, but he watched Hilda intently. She must certainly, he reflected, be thirty, and he was honestly delighted to see that the years had treated her so indulgently. If her face had changed at all, it was in a slight hardening of the mouth—still eager enough to be very disconcerting at times, he felt—and in an added air of self-possession and self-reliance. She carried her head, too, a little more resolutely. “Why, how absurd! As if I were not always interested!” Hilda exclaimed. “Does it? Oh, how fine it all is, your coming on like this! But I didn’t want you to think it was because of that I wanted to see you.” He spoke very seriously and looked down at the floor. She gave him her hand and flushed and laughed. He bent over it a little stiffly. She went away on Lady Walford’s arm, and as he stood watching her yellow train glide down the long floor he looked rather sullen. He felt that he had not come out of it very brilliantly. On Sunday afternoon Alexander remembered Miss Burgoyne’s invitation and called at her apartment. He found it a delightful little place and he met charming people there. Hilda lived alone, attended by a very pretty and competent French servant who answered the door and brought in the tea. Alexander arrived early, and some twenty-odd people dropped in during the course of the afternoon. Hugh MacConnell came with his sister, and stood about, managing his tea-cup awkwardly and watching every one out of his deep-set, faded eyes. He seemed to have made a resolute effort at tidiness of attire, and his sister, a robust, florid woman with a splendid joviality about her, kept eyeing his freshly creased clothes apprehensively. It was not very long, indeed, before his coat hung with a discouraged sag from his gaunt shoulders and his hair and beard were rumpled as if he had been out in a gale. His dry humor went under a cloud of absent-minded kindliness which, Mainhall explained, always overtook him here. He was never so witty or so sharp here as elsewhere, and Alexander thought he behaved as if he were an elderly relative come in to a young girl’s party. When Bartley arrived at Bedford Square on Sunday evening, Marie, the pretty little French girl, met him at the door and conducted him upstairs. Hilda was writing in her living-room, under the light of a tall desk lamp. Bartley recognized the primrose satin gown she had worn that first evening at Lady Walford’s. “I expect it was the last franc I had. What a strong brown face she had, and very tragic. She looked at us with such despair and longing, out from under her black shawl. What she wanted from us was neither our flowers nor our francs, but just our youth. I remember it touched me so. I would have given her some of mine off my back, if I could. I had enough and to spare then,” Bartley mused, and looked thoughtfully at his cigar. Bartley started when Hilda rang the little bell beside her. “Dear me, why did you do that? I had quite forgotten—I was back there. It was very jolly,” he murmured lazily, as Marie came in to take away the coffee. She uttered a little cry, threw her arms over her head, and drew his face down to hers. “Are you going to let me love you a little, Bartley?” she whispered. A little before three o’clock Mrs. Alexander went into the library to see that everything was ready. She pulled the window shades high, for the weather was dark and stormy, and there was little light, even in the streets. A foot of snow had fallen during the morning, and the wide space over the river was thick with flying flakes that fell and wreathed the masses of floating ice. Winifred was standing by the window when she heard the front door open. She hurried to the hall as Alexander came stamping in, covered with snow. He kissed her joyfully and brushed away the snow that fell on her hair. “Oh, I was in London about ten days in the summer. Went to escape the hot weather more than anything else. I shan’t be gone more than a month this time. Winifred and I have been up in Canada for most of the autumn. That Moorlock Bridge is on my back all the time. I never had so much trouble with a job before.” Alexander moved about restlessly and fell to poking the fire. “No; it’s only when you are troubled and harassed that I feel worried, Bartley. I wish you always seemed as you do to-night. But you don’t, always.” She looked earnestly and inquiringly into his eyes. On New Year’s day a thaw set in, and during the night torrents of rain fell. In the morning, the morning of Alexander’s departure for England, the river was streaked with fog and the rain drove hard against the windows of the breakfast-room. Alexander had finished his coffee and was pacing up and down. His wife sat at the table, watching him. She was pale and unnaturally calm. When Thomas brought the letters, Bartley sank into his chair and ran them over rapidly. Bartley began jingling some loose coins in his pocket. “I wish things would let me rest. I’m tired of work, tired of people, tired of trailing about.” He looked out at the storm-beaten river. On the afternoon of the third day out, Alexander was sitting well to the stern, on the windward side where the chairs were few, his rugs over him and the collar of his fur-lined coat turned up about his ears. The weather had so far been dark and raw. For two hours he had been watching the low, dirty sky and the beating of the heavy rain upon the iron-colored sea. There was a long, oily swell that made exercise laborious. The decks smelled of damp woolens, and the air was so humid that drops of moisture kept gathering upon his hair and mustache. He seldom moved except to brush them away. The great open spaces made him passive and the restlessness of the water quieted him. He intended during the voyage to decide upon a course of action, but he held all this away from him for the present and lay in a blessed gray oblivion. Deep down in him somewhere his resolution was weakening and strengthening, ebbing and flowing. The thing that perturbed him went on as steadily as his pulse, but he was almost unconscious of it. He was submerged in the vast impersonal grayness about him, and at intervals the sidelong roll of the boat measured off time like the ticking of a clock. He felt released from everything that troubled and perplexed him. It was as if he had tricked and outwitted torturing memories, had actually managed to get on board without them. He thought of nothing at all. If his mind now and again picked a face out of the grayness, it was Lucius Wilson’s, or the face of an old schoolmate, forgotten for years; or it was the slim outline of a favorite greyhound he used to hunt jack-rabbits with when he was a boy. Toward six o’clock the wind rose and tugged at the tarpaulin and brought the swell higher. After dinner Alexander came back to the wet deck, piled his damp rugs over him again, and sat smoking, losing himself in the obliterating blackness and drowsing in the rush of the gale. Before he went below a few bright stars were pricked off between heavily moving masses of cloud. In the afternoon he wrote a long letter to Winifred. Later, as he walked the deck through a splendid golden sunset, his spirits rose continually. It was agreeable to come to himself again after several days of numbness and torpor. He stayed out until the last tinge of violet had faded from the water. There was literally a taste of life on his lips as he sat down to dinner and ordered a bottle of champagne. He was late in finishing his dinner, and drank rather more wine than he had meant to. When he went above, the wind had risen and the deck was almost deserted. As he stepped out of the door a gale lifted his heavy fur coat about his shoulders. He fought his way up the deck with keen exhilaration. The moment he stepped, almost out of breath, behind the shelter of the stern, the wind was cut off, and he felt, like a rush of warm air, a sense of close and intimate companionship. He started back and tore his coat open as if something warm were actually clinging to him beneath it. He hurried up the deck and went into the saloon parlor, full of women who had retreated thither from the sharp wind. He threw himself upon them. He talked delightfully to the older ones and played accompaniments for the younger ones until the last sleepy girl had followed her mother below. Then he went into the smoking-room. He played bridge until two o’clock in the morning, and managed to lose a considerable sum of money without really noticing that he was doing so. “What about us, Bartley?” she asked in a thin voice. “I can’t live with myself any longer,” he answered roughly. “It . . . it hasn’t always made you miserable, has it?” Her eyelids fell and her lips quivered. “But why NOW?” she asked piteously, wringing her hands. At that word “deception,” spoken with such self-contempt, the color flashed back into Hilda’s face as suddenly as if she had been struck by a whiplash. She bit her lip and looked down at her hands, which were clasped tightly in front of her. His hand shut down quickly over the questioning fingers on his sleeves. “Yes, Hilda; I know that,” he said simply. “I can’t,” he said heavily. When he reached Hilda’s apartment she met him, fresh as the morning itself. Her rooms were flooded with sunshine and full of the flowers he had been sending her. She would never let him give her anything else. “Are you busy this morning, Hilda?” he asked as he sat down, his hat and gloves in his hand. Bartley rose and inspected her. “Why don’t you wear some of those pink roses?” he asked. Hilda looked up with a smile which she tried not to make too glad. “I think people were meant to be happy, a little,” she said. Hilda sighed. “No, I’m not. Not about some things, at any rate. It doesn’t take pluck to fight for one’s moment, but it takes pluck to go without—a lot. More than I have. I can’t help it,” she added fiercely. “All the same, I believe she used to feel it when we stood there and watched her and wished her well. I believe she used to remember,” Hilda said thoughtfully. “What do you mean, Mac?” Hilda asked nervously. “Terribly, dangerously happy, Mac,”—Hilda spoke quietly, pressing the rough sleeve of his greatcoat with her gloved hand. It is after twelve o’clock. Every one else is in bed and I am sitting alone in my study. I have been happier in this room than anywhere else in the world. Happiness like that makes one insolent. I used to think these four walls could stand against anything. And now I scarcely know myself here. Now I know that no one can build his security upon the nobleness of another person. Two people, when they love each other, grow alike in their tastes and habits and pride, but their moral natures (whatever we may mean by that canting expression) are never welded. The base one goes on being base, and the noble one noble, to the end. And what have you to do, Hilda, with this ugly story? Nothing at all. The little boy drank of the prettiest brook in the forest and he became a stag. I write all this because I can never tell it to you, and because it seems as if I could not keep silent any longer. And because I suffer, Hilda. If any one I loved suffered like this, I’d want to know it. Help me, Hilda! On the last Saturday in April, the New York “Times” published an account of the strike complications which were delaying Alexander’s New Jersey bridge, and stated that the engineer himself was in town and at his office on West Tenth Street. On Sunday, the day after this notice appeared, Alexander worked all day at his Tenth Street rooms. His business often called him to New York, and he had kept an apartment there for years, subletting it when he went abroad for any length of time. Besides his sleeping-room and bath, there was a large room, formerly a painter’s studio, which he used as a study and office. It was furnished with the cast-off possessions of his bachelor days and with odd things which he sheltered for friends of his who followed itinerant and more or less artistic callings. Over the fireplace there was a large old-fashioned gilt mirror. Alexander’s big work-table stood in front of one of the three windows, and above the couch hung the one picture in the room, a big canvas of charming color and spirit, a study of the Luxembourg Gardens in early spring, painted in his youth by a man who had since become a portrait-painter of international renown. He had done it for Alexander when they were students together in Paris. Sunday was a cold, raw day and a fine rain fell continuously. When Alexander came back from dinner he put more wood on his fire, made himself comfortable, and settled down at his desk, where he began checking over estimate sheets. It was after nine o’clock and he was lighting a second pipe, when he thought he heard a sound at his door. He started and listened, holding the burning match in his hand; again he heard the same sound, like a firm, light tap. He rose and crossed the room quickly. When he threw open the door he recognized the figure that shrank back into the bare, dimly lit hallway. He stood for a moment in awkward constraint, his pipe in his hand. He was standing behind the table, turning over a pile of blueprints nervously. The yellow light from the student’s lamp fell on his hands and the purple sleeves of his velvet smoking-jacket, but his flushed face and big, hard head were in the shadow. There was something about him that made Hilda wish herself at her hotel again, in the street below, anywhere but where she was. “Of course I know, Bartley,” she said at last, “that after this you won’t owe me the least consideration. But we sail on Tuesday. I saw that interview in the paper yesterday, telling where you were, and I thought I had to see you. That’s all. Good-night; I’m going now.” She turned and her hand closed on the door-knob. Alexander faced her, resting his arm on the mantel behind him, and began to brush the sleeve of his jacket. “Is this the way you mean to answer it, Hilda?” he asked unsteadily. She was afraid to look up at him. “Didn’t—didn’t you mean even to say goodby to me, Bartley? Did you mean just to—quit me?” she asked. “I came to tell you that I’m willing to do as you asked me. But it’s no use talking about that now. Give me my things, please.” She put her hand out toward the fender. Alexander slipped his arm about her. “I didn’t know it before, Hilda, on my honor I didn’t, but I believe it was because, deep down in me somewhere, I was hoping I might drive you to do just this. I’ve watched that door all day. I’ve jumped up if the fire crackled. I think I have felt that you were coming.” He bent his face over her hair. There was a flash in her eyes that made Alexander’s fall. He got up and went over to the window, threw it open, and leaned out. He heard Hilda moving about behind him. When he looked over his shoulder she was lacing her boots. He went back and stood over her. It was quite dark and Alexander was still thinking of the boys, when it occurred to him that the train must be nearing Allway. In going to his new bridge at Moorlock he had always to pass through Allway. The train stopped at Allway Mills, then wound two miles up the river, and then the hollow sound under his feet told Bartley that he was on his first bridge again. The bridge seemed longer than it had ever seemed before, and he was glad when he felt the beat of the wheels on the solid roadbed again. He did not like coming and going across that bridge, or remembering the man who built it. And was he, indeed, the same man who used to walk that bridge at night, promising such things to himself and to the stars? And yet, he could remember it all so well: the quiet hills sleeping in the moonlight, the slender skeleton of the bridge reaching out into the river, and up yonder, alone on the hill, the big white house; upstairs, in Winifred’s window, the light that told him she was still awake and still thinking of him. And after the light went out he walked alone, taking the heavens into his confidence, unable to tear himself away from the white magic of the night, unwilling to sleep because longing was so sweet to him, and because, for the first time since first the hills were hung with moonlight, there was a lover in the world. And always there was the sound of the rushing water underneath, the sound which, more than anything else, meant death; the wearing away of things under the impact of physical forces which men could direct but never circumvent or diminish. Then, in the exaltation of love, more than ever it seemed to him to mean death, the only other thing as strong as love. Under the moon, under the cold, splendid stars, there were only those two things awake and sleepless; death and love, the rushing river and his burning heart. But Alexander cut him short. “When did you stop work?” he asked sharply. “Those poor women out there, do they blame him very much?” she asked, as she handed the coffee-cup back to Horton. “Don’t be afraid to tell me the worst, Mr. Horton. Don’t leave me to the dread of finding out things that people may be saying. If he is blamed, if he needs any one to speak for him,”—for the first time her voice broke and a flush of life, tearful, painful, and confused, swept over her rigid pallor,—“if he needs any one, tell me, show me what to do.” She began to sob, and Horton hurried away. When he came back at four o’clock in the afternoon he was carrying his hat in his hand, and Winifred knew as soon as she saw him that they had found Bartley. She opened the carriage door before he reached her and stepped to the ground. The group of men down under the riverbank fell back when they saw a woman coming, and one of them threw a tarpaulin over the stretcher. They took off their hats and caps as Winifred approached, and although she had pulled her veil down over her face they did not look up at her. She was taller than Horton, and some of the men thought she was the tallest woman they had ever seen. “As tall as himself,” some one whispered. Horton motioned to the men, and six of them lifted the stretcher and began to carry it up the embankment. Winifred followed them the half-mile to Horton’s house. She walked quietly, without once breaking or stumbling. When the bearers put the stretcher down in Horton’s spare bedroom, she thanked them and gave her hand to each in turn. The men went out of the house and through the yard with their caps in their hands. They were too much confused to say anything as they went down the hill. Professor Wilson had been living in London for six years and he was just back from a visit to America. One afternoon, soon after his return, he put on his frock-coat and drove in a hansom to pay a call upon Hilda Burgoyne, who still lived at her old number, off Bedford Square. He and Miss Burgoyne had been fast friends for a long time. He had first noticed her about the corridors of the British Museum, where he read constantly. Her being there so often had made him feel that he would like to know her, and as she was not an inaccessible person, an introduction was not difficult. The preliminaries once over, they came to depend a great deal upon each other, and Wilson, after his day’s reading, often went round to Bedford Square for his tea. They had much more in common than their memories of a common friend. Indeed, they seldom spoke of him. They saved that for the deep moments which do not come often, and then their talk of him was mostly silence. Wilson knew that Hilda had loved him; more than this he had not tried to know. It was late when Wilson reached Hilda’s apartment on this particular December afternoon, and he found her alone. She sent for fresh tea and made him comfortable, as she had such a knack of making people comfortable. “How good you were to come back before Christmas! I quite dreaded the Holidays without you. You’ve helped me over a good many Christmases.” She smiled at him gayly. Hilda considered vaguely. “Has she grown much older?” she asked at last. And tell her she’s your own true love.